During the six weeks so far of running the October-November writing challenges, I have rarely missed writing daily. My goal for putting my writing first each day was to accumulate more pages. Despite a couple of personal setbacks, that has certainly happened. I’ve logged in anywhere from twenty minutes to four hours, depending on the day’s schedule. I’ve accomplished more in the last six weeks than in the three months preceding the challenges. That in itself is enough reason for me to keep doing the writing first. But there’s more! There’s been an unexpected bonus attached to writing first in the day whenever possible. I noticed it at the end of the week. My personal plan was to write first, just Monday through Friday, for as long as my schedule allowed. By Saturday morning, I had a long list of chores and errands that had piled up. They would take all day probably, so I promised myself I’d get my daily writing done at the end of the day. I looked longingly at the writing notes spread out on my work table. I knew from experience I’d be too tired to write anything of substance late in the day. And I had so enjoyed the writing the first week. Writing done before I was tired from the day’s events was relaxed and many times, even fun. I also found myself thinking about my characters during odd moments of the day, as my brain chewed away on a few plot tangles I’d uncovered. I’d gained momentum, and I didn’t want to lose it. The dictionary defines momentum as “strength and force gained by motion.” The momentum of writing each day had become a strong force gained by daily motions. For the first time in many years, I had actually been eager to write. I remembered that kind of excitement thirty-plus years ago when I took a writing course. Back then, I couldn’t wait to get the babies down for naps so I could write. I hadn’t felt that way for so long that I’d forgotten how wonderful it was. Try It. You Might Like It! What a terrific added bonus for writing first thing each day. If you have lost the joy of creating, give this method a try for a week or so. Go to bed earlier so you can get up earlier, if necessary. See if it makes a difference. 3. Third, if your fears are real, face them squarely and deal with them. Do you really lack sufficient writing skills? If so, enroll in a course. Study writing books on your own. Analyze the books you love best to see how those authors did what they did. Take a public speaking course if you want to be a storyteller or give talks for groups. Take an assertiveness course or get help for your codependency if nasty family members really are holding you back from trying. “But I am afraid!” you say, terror creeping in around the edges of your voice. I know you are. I’ll tell you a secret. We all are. We wear masks to hide it, but we all deal with the fear of writing. How? We learned, finally, to do the writing afraid. We learned that fear didn’t have to stop us, that most things we could go ahead and do whether we were scared or not. We research, even if we’re afraid our idea is overdone. We write rough drafts, even when we’re afraid the whole thing stinks. We submit to publishers, even though we’re afraid that editors cringe when they spot our name on a manuscript. Of course, the magic finally occurs. After many, many repetitions, the fear disperses. It almost disappears. Susan Jeffers wrote a book some years ago called Feel the Fear and Do It Anyway. The title says it all. It’s okay to feel the emotion of fear; it doesn’t mean we have to turn tail and run. I’m a great believer in Mini Habits, with teeny tiny goals (such as, “I will write for five minutes today.”) I feel no resistance to writing for five minutes, so it takes no motivation or willpower to do it. And, of course, it often goes way beyond five minutes. This would help many of you too. The act of writing would dispel many of your fears. If you could see my office, you’d notice the four signs I have taped up that say in big, bold letters, “Work! Don’t worry. Inaction feeds worry. Action attacks worry.” Yes, even five minutes of writing will do so. Don’t stay frozen. Tackle those fears. Start small. Celebrate each baby step taken as a victory. Don’t hesitate to ask people for advice and encouragement. Study books. Listen to audio tapes. Read articles. Make banners or posters for your office. Leave Post-It notes on your computer. Use every means possible to remind yourself that you can conquer the thing that you fear. You’ve conquered fears in the past, and you can do it again! Don’t let fear stand between you and the writing career of your dreams. I’ve been thinking about this while hostessing the October and November writing challenges and reading between the lines of some questions and comments. All our writing tomorrows give us that very same choice: fear or faith in our creativity. Do we face our blank computer screens or empty tablets with fear or with faith? Faith encourages us and spurs us on. Fears paralyze—and need to be dealt with. Writing anxiety comes in many forms and develops for a variety of reasons. If we harbor writing fears, how can we identify them, eliminate them, then regain faith in our writing tomorrows? Dealing with creative fears generally involves a three-part process. 1. First, identify the fears. Otherwise you’re only shadow boxing. What are you afraid of? That your ideas are stupid or overdone? That you don’t have the talent to be a published writer? That your friends or family will ridicule you when they find out what you’re trying to do? That you’ll be rejected? That you’ll be wasting your time, that being a writer is just a dream that will dissolve in the face of reality? That you’ll never be more than a mid-list author on the brink of oblivion? Besides, if you don’t, you’ll go from blocked to frozen, then give up. Quitting is failing. While none of us may ever totally conquer our writing fears—and some experts say that this writing “anxiety” is actually indispensable writing energy—we can rise above the fears sufficiently so that we can work. And in doing the work, day in and day out, the fears begin to dissolve. They become like the monster we were so sure, as children, that lurked under our bed. After enough years of NOT being eaten alive at night or being grabbed by the ankles when we jumped out of bed, we finally concluded the monster was in our imagination and forgot about it. Most of your writing fears will do the same thing IF you face them and feel them—and write anyway. England! Tea and scones. Castles. Cathedrals. Visiting homes of British writers. Writers have dreams, and one dream of mine has always been to visit the homes of my favorite British authors. I finally did it! (Photos below.) This was a trip I’d planned and saved for all year. Since I last blogged, I spent ten days in England, part research for a new book and part marketing for a book due out in November (both set in England). 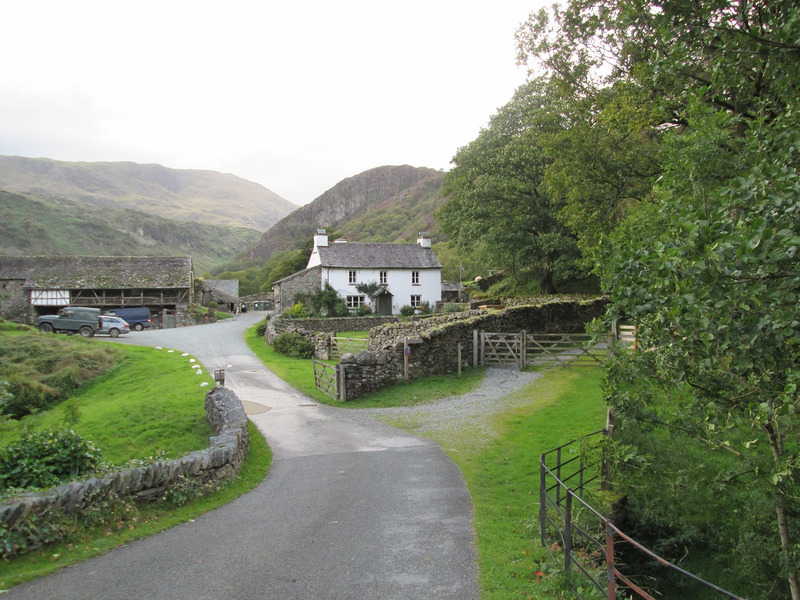 It was the trip of a lifetime, walking in the footsteps of Jane Austen, Charlotte Bronte, and Beatrix Potter. Below are just a few photos of the 895 prints I ordered. More will go up on Facebook. I’m still working on my scrap book, adding in all the little momentoes like train tickets and British money. 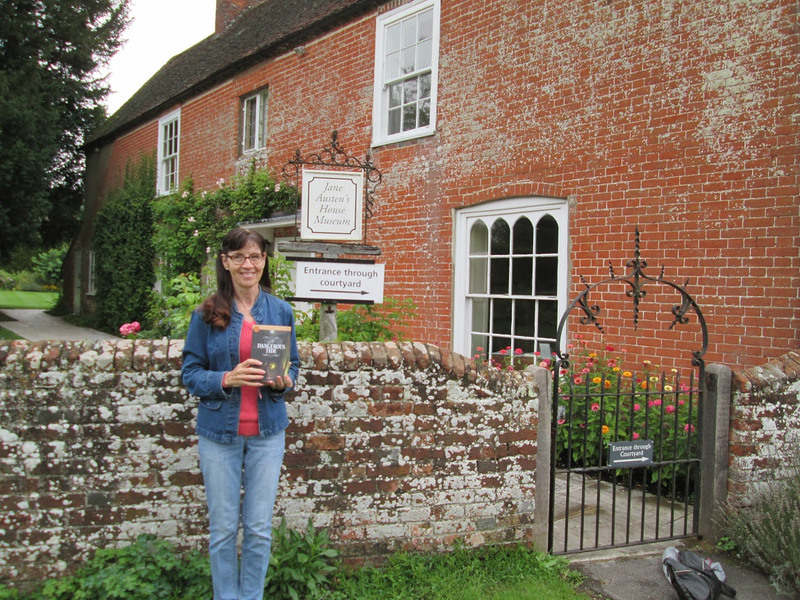 I did a bit of marketing at the Jane Austen home in Chawton. When A Dangerous Tide is released in November, they’ll read a copy and decide whether to include it in their gift shop fiction section of books featuring Jane Austen. That would be such an honor. The first photo is outside her home. 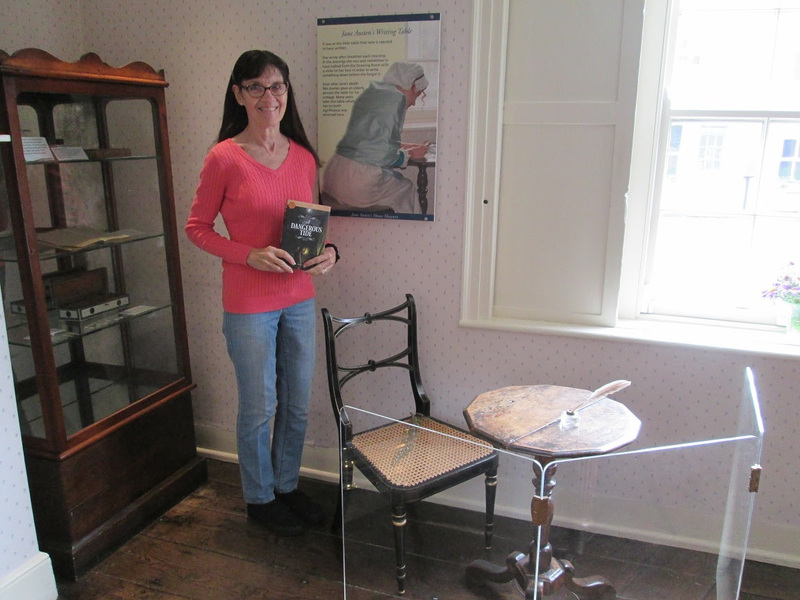 The second photo has my early copy of the book RIGHT BESIDE where Jane wrote Pride and Prejudice! 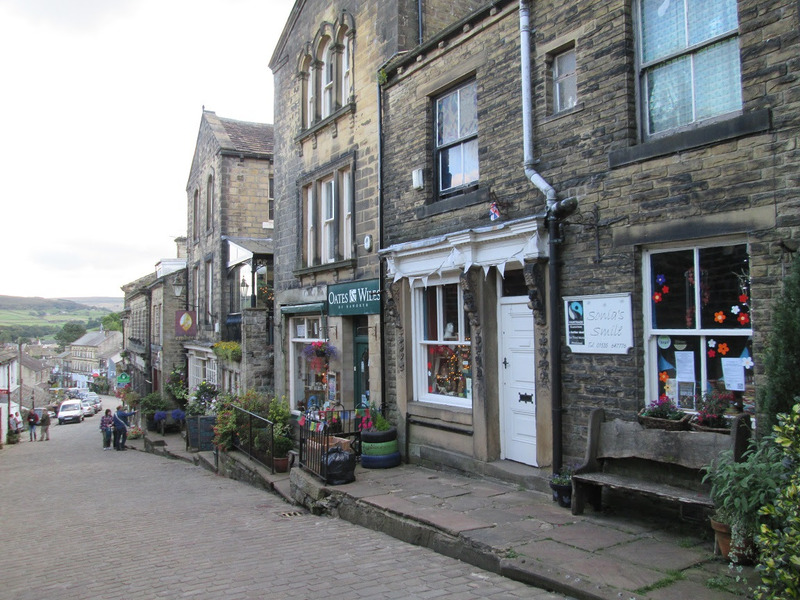 I also did a lot of research in Haworth, in the Yorkshires where the Brontes lived and died, for a mystery due in the spring. 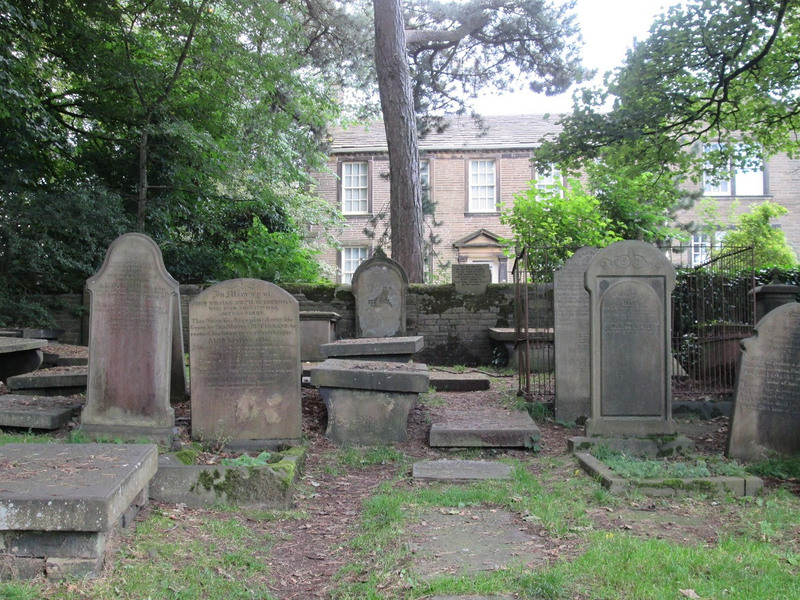 It certainly brought Jane Eyre alive for me, after walking over the moors, seeing where Charlotte wrote, and visiting the graveyard beside the parsonage. So much ATMOSPHERE there. Below are photos showing her home, the graveyard, and the steep cobblestone street up to her home. No photos were allowed inside. 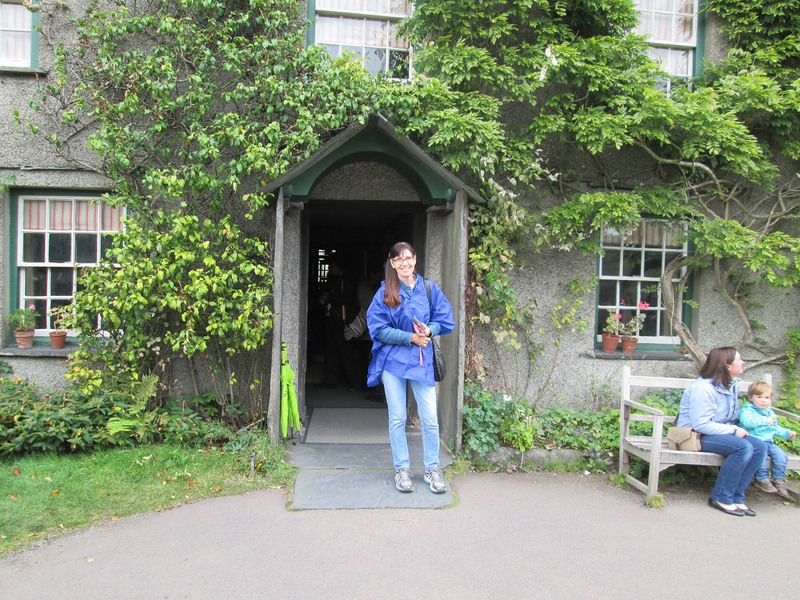 The last author home and surroundings that I visited was Beatrix Potter’s in the Lake District. As many of you know, she donated 14 farms and 4,000 acres to the National Trust. If you’ve seen the excellent movie, “Miss Potter,” you know her story. Below I’m standing in front of Hill Top Farm where she lived. 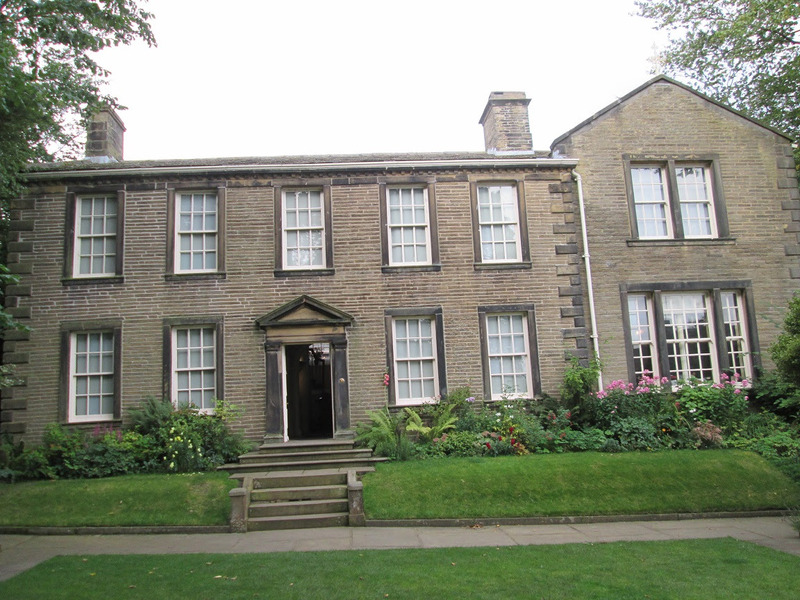 Both her home and the Bronte parsonage were left exactly as when the authors lived there. For other “Miss Potter” fans, the photo at the bottom is the movie set, as they weren’t allowed to film the movie in her real home. No photos were allowed inside, so I bought lots of guide books and post cards! Not every writer’s dream is receiving a bestseller or mega award. One of mine for years has been to visit England, go back in time to a simpler time for writers, and “live it” for a while. A bonus? On the ninth day, while hiking in the Lake District, a book series idea came to me. It seemed fitting. I’ve enjoyed our writing challenges in the past few years, and I’ve decided to do two of them this fall. The first one runs from October 1 to October 31. The second one is during NaNoWriMo, the frenzied writing month of November. 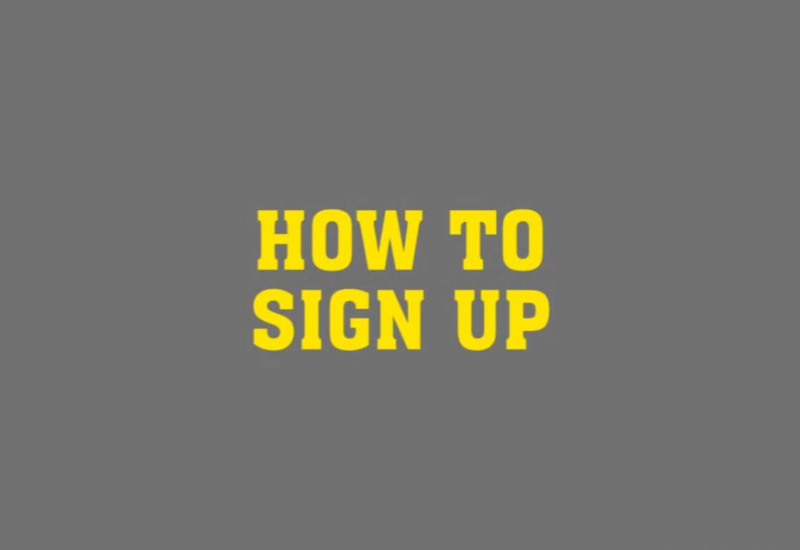 You can sign up (at the end) for either challenge or both. I need the accountability myself, and I found in the past that there’s no better way to stay on track with daily writing than having accountability. 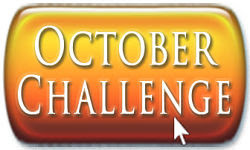 For the October Challenge, choose any writing goal or goals you prefer. Reading the articles above will give you some good ideas about the goals you might set. They can be time goals (I will write fifteen minutes every day, I will write first thing in the morning in my journal, I will revise my work-in-progress one hour every day) or production goals (I will write 50 new words every day, I will write a new poem every day). You can choose more than one writing goal, but if you do, I highly recommend that you make the goals almost ridiculously small so they don’t intimidate. You can always write more! Getting into the habit is the main thing, so keep the goals small. For the NaNoWriMo November Writing Challenge, we’ll do a modified NaNoWriMo. At the official NaNoWriMo site, the challenge is to write 50,000 words during the month. But maybe that goal’s too big for the size of your writing project, your time available, your health, or any other reason. The daily challenge that you decide on for November is up to you. The only requirement for my modified NaNoWriMo is that it be FICTION. That’s it! You have until September 30 to sign up, but I won’t be adding new names to the lists after that. Near the end of September I will send a reminder email to everyone who signs up . I look forward to us helping each other have a productive writing fall!